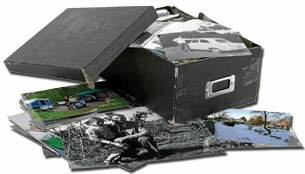 Do you have shoeboxes full of photos? Bring them to us! We will scan and archive your photos to a CD OR DVD. Transferring your photos to digital format helps preseve your memories for years to come. Once scanned they will retain their original beauty with no loss in quality and you can easily order more prints with family or share copies of the entire CD. We wil only scan loose prints. Please remove prints from albums and envelopes. together - facing the same direction. When requesting a specific image order, please sort in order of importance. An additional charge of $25.00 will be applied to maintain order. Remove all tape, staples, paper clips, glue or orther attachments from pictures. Damaged or mounted prints can be scanned (additional charges apply). Prints with writing on the back should be grouped together if you'd like the backside information scanned. A handling charge will be applied to photos needing pre-scanning prep. 5x7 index prints with image thumbnails and file size $1.99/each. $25.00 set-up fee per order. Prints scanned at 300dpi at orginal size. Files are saved as JPG and numbered randomly. Prices for prints sized wallet to 8x10. Prints scanned at 600dpi at orginal size. Files are saved as JPG and numbered randomly. Prices for prints sized wallet to 8x10.